Jan van Berkum was born in Jakarta, in what was then the Dutch East Indies. He survived the World War II invasion of Indonesia by hiding with his mother and three brothers until the island was liberated. He later moved to the Netherlands and served in the Dutch Navy. After his military service, Jan emigrated to the United States. He met and married Jacqueline "Mémé" Cella, a young French woman. Jan worked at various jobs while continuing his education and graduated with a degree in aeronautical engineering. 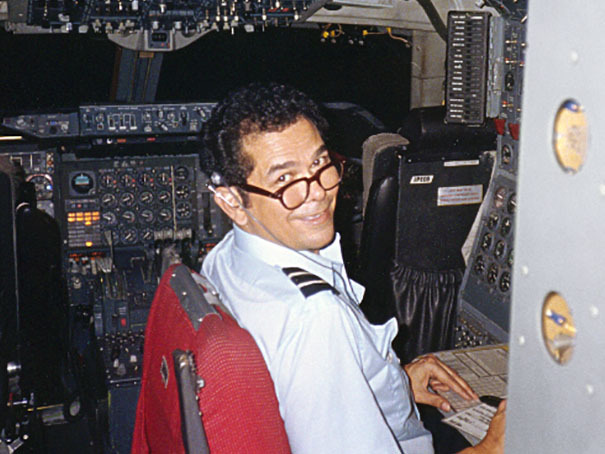 He began his airline career, spanning more than 30 years, at Seaboard in 1968. Jan van Berkum is survived by his wife of 56 years, Jacqueline; his daughter, Christiane (Rick) Madsen; son, John van Berkum (Stephanie); and five grandchildren. He is seen here in the cockpit of a Flying Tigers Boeing 747.